This article is about the Spanish saint. For the national personification of the Philippines, see Juan dela Cruz. John of the Cross (Spanish: San Juan de la Cruz; 1542 – 14 December 1591) was a major figure of the Counter-Reformation, a Spanish mystic, a Roman Catholic saint, a Carmelite friar and a priest, who was born at Fontiveros, Old Castile. John of the Cross is known for his writings. Both his poetry and his studies on the growth of the soul are considered the summit of mystical Spanish literature and one of the peaks of all Spanish literature. He was canonized as a saint in 1726 by Pope Benedict XIII. He is one of the thirty-six Doctors of the Church. He was born Juan de Yepes y Álvarez into a converso family (descendents of Jewish converts to Christianity) in Fontiveros, near Ávila, a town of around 2,000 people. His father, Gonzalo, was an accountant to richer relatives who were silk merchants. However, when in 1529 he married John's mother, Catalina, who was an orphan of a lower class, Gonzalo was rejected by his family and forced to work with his wife as a weaver. John's father died in 1545, while John was still only around three years old. Two years later, John's older brother Luis died, probably as a result of insufficient nourishment caused by the penury to which John's family had been reduced. After this, John's mother Catalina took John and his surviving brother Francisco, and moved first in 1548 to Arévalo, and then in 1551 to Medina del Campo, where she was able to find work weaving. In Medina, John entered a school for around 160 poor children, usually orphans, receiving a basic education, mainly in Christian doctrine, as well as some food, clothing and lodging. While studying there, he was chosen to serve as acolyte at a nearby monastery of Augustinian nuns. Growing up, John worked at a hospital and studied the humanities at a Jesuit school from 1559 to 1563; the Society of Jesus was a new organization at the time, having been founded only a few years earlier by the Spaniard St. Ignatius of Loyola. In 1563 he entered the Carmelite Order, adopting the name John of St. Matthias. John was ordained a priest in 1567, and then indicated his intent to join the strict Carthusian Order, which appealed to him because of its encouragement of solitary and silent contemplation. A journey from Salamanca to Medina del Campo, probably in September 1567, changed this. In Medina he met the charismatic Carmelite nun Teresa of Jesus (or Ávila). She was in Medina to found the second of her convents for women. She immediately talked to him about her reformation projects for the Order: she was seeking to restore the purity of the Carmelite Order by restarting observance of its "Primitive Rule" of 1209, observance of which had been relaxed by Pope Eugene IV in 1432. Under this Rule, much of the day and night was to be spent in the recitation of the choir offices, study and devotional reading, the celebration of Mass and times of solitude. For the friars, time was to be spent evangelizing the population around the monastery. Total abstinence from meat and lengthy fasting was to be observed from the Feast of the Exaltation of the Cross (September 14) until Easter. There were to be long periods of silence, especially between Compline and Prime. Coarser, shorter habits, more simple than those worn since 1432, were to be worn. They were to follow the injunction against the wearing of shoes (also mitigated in 1432). It was from this last observance that the followers of Teresa among the Carmelites were becoming known as "discalced", i.e., barefoot, differentiating themselves from the non-reformed friars and nuns. Teresa asked John to delay his entry into the Carthusians and to follow her. Having spent a final year studying in Salamanca, in August 1568 John traveled with Teresa from Medina to Valladolid, where Teresa intended to found another monastery of nuns. Having spent some time with Teresa in Valladolid, learning more about this new form of Carmelite life, in October 1568, accompanied by Friar Antonio de Jesús de Heredia, John left Valladolid to found a new monastery for friars, the first for men following Teresa's principles. They were given the use of a derelict house at Duruelo (midway between Ávila and Salamanca), which had been donated to Teresa. On 28 November 1568, the monastery was established, and on that same day John changed his name to "John of the Cross". Soon after, in June 1570, the friars found the house at Duruelo too small, and so moved to the nearby town of Mancera de Abajo. After moving on from this community, John set up a new community at Pastrana (October 1570), and a community at Alcalá de Henares, which was to be a house of studies for the academic training of the friars. In 1572 he arrived in Ávila, at the invitation of Teresa, who had been appointed prioress of the Monastery of the Incarnation there in 1571. John became the spiritual director and confessor for Teresa and the other 130 nuns there, as well as for a wide range of laypeople in the city. In 1574, John accompanied Teresa in the foundation of a new monastery in Segovia, returning to Ávila after staying there a week. Beyond this, though, John seems to have remained in Ávila between 1572 and 1577. 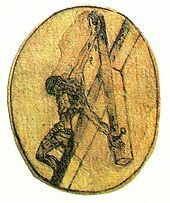 At some point between 1574 and 1577, while praying in the Monastery of the Incarnation in Ávila in a loft overlooking the sanctuary, John had a vision of the crucified Christ, which led him to create his famous drawing of Christ "from above". In 1641, this drawing was placed in a small monstrance and kept in Ávila. This drawing inspired the artist Salvador Dalí's 1951 work Christ of Saint John of the Cross. The years 1575–77, however, saw a great increase in the tensions among the Spanish Carmelite friars over the reforms of Teresa and John. Since 1566 the reforms had been overseen by Canonical Visitors from the Dominican Order, with one appointed to Castile and a second to Andalusia. These Visitors had substantial powers: they could move the members of religious communities from house to house and even province to province. They could assist religious superiors in their office, and could depute other superiors from either the Dominicans or Carmelites. In Castile, the Visitor was Pedro Fernández, who prudently balanced the interests of the Discalced Carmelites against those of the friars and nuns who did not desire reform. In Andalusia to the south, however, where the Visitor was Francisco Vargas, tensions rose due to his clear preference for the Discalced friars. Vargas asked them to make foundations in various cities, in explicit contradiction of orders from the Carmelite Prior General against their expansion in Andalusia. As a result, a General Chapter of the Carmelite Order was convened at Piacenza in Italy in May 1576, out of concern that events in Spain were getting out of hand, which concluded by ordering the total suppression of the Discalced houses. This measure was not immediately enforced. King Philip II of Spain was supportive of some of Teresa's reforms, and so was not immediately willing to grant the necessary permission to enforce this ordinance. The Discalced friars also found support from the papal nuncio to King Philip II, Nicolò Ormaneto [it], Bishop of Padua, who still had ultimate power as nuncio to visit and reform religious Orders. When asked by the Discalced friars to intervene, Ormaneto replaced Vargas as Visitor of the Carmelites in Andalusia (where the troubles had begun) with Jerónimo Gracián, a priest from the University of Alcalá, who was in fact a Discalced Carmelite friar himself. The nuncio's protection helped John avoid problems for a time. In January 1576, John was arrested in Medina del Campo by some Carmelite friars. However, through the nuncio's intervention, John was soon released. When Ormaneto died on 18 June 1577, however, John was left without protection, and the friars opposing his reforms gained the upper hand. El Greco's landscape of Toledo depicts the priory in which John was held captive, just below the old Muslim alcázar and perched on the banks of the Tajo on high cliffs. After being nursed back to health, first with Teresa's nuns in Toledo, and then during six weeks at the Hospital of Santa Cruz, John continued with reform. In October 1578 he joined a meeting at Almodóvar del Campo of the supporters of reform, increasingly known as the Discalced Carmelites. There, in part as a result of the opposition faced from other Carmelites in recent years, they decided to demand from the Pope their formal separation from the rest of the Carmelite Order. At this meeting John was appointed superior of El Calvario, an isolated monastery of around thirty friars in the mountains about 6 miles away from Beas in Andalusia. During this time he befriended the nun Ana de Jesús, superior of the Discalced nuns at Beas, through his visits every Saturday to the town. While at El Calvario he composed his first version of his commentary on his poem, The Spiritual Canticle, perhaps at the request of the nuns in Beas. In 1579 he moved to Baeza, a town of around 50,000 people, to serve as rector of a new college, the Colegio de San Basilio, to support the studies of Discalced friars in Andalusia. This opened on 13 June 1579. He remained in post there until 1582, spending much of his time as a spiritual director for the friars and townspeople. 1580 was an important year in the resolution of the disputes within the Carmelites. On 22 June, Pope Gregory XIII signed a decree, titled Pia Consideratione, which authorised a separation between the Calced and Discalced Carmelites. The Dominican friar Juan Velázquez de las Cuevas was appointed to carry out the decisions. At the first General Chapter of the Discalced Carmelites, in Alcalá de Henares on 3 March 1581, John of the Cross was elected one of the "Definitors" of the community, and wrote a set of constitutions for them. By the time of the Provincial Chapter at Alcalá in 1581, there were 22 houses, some 300 friars and 200 nuns in the Discalced Carmelites. In November 1581, John was sent by Teresa to help Ana de Jesús in founding a convent in Granada. Arriving in January 1582, she set up a monastery of nuns, while John stayed in the friars' monastery of Los Mártires, beside the Alhambra, becoming its prior in March 1582. While here, he learned of the death of Teresa in October of that year. In February 1585, John travelled to Málaga and established a monastery of Discalced nuns there. In May 1585, at the General Chapter of the Discalced Carmelites in Lisbon, John was elected Provincial Vicar of Andalusia, a post which required him to travel frequently, making annual visitations of the houses of friars and nuns in Andalusia. During this time he founded seven new monasteries in the region, and is estimated to have travelled around 25,000 km. In June 1588, he was elected third Councillor to the Vicar General for the Discalced Carmelites, Father Nicolas Doria. To fulfill this role, he had to return to Segovia in Castile, where in this capacity he was also prior of the monastery. After disagreeing in 1590–1 with some of Doria's remodeling of the leadership of the Discalced Carmelite Order, though, John was removed from his post in Segovia, and sent by Doria in June 1591 to an isolated monastery in Andalusia called La Peñuela. There he fell ill, and traveled to the monastery at Úbeda for treatment. His condition worsened, however, and he died there on 14 December 1591, of erysipelas. The morning after John’s death huge numbers of the townspeople of Úbeda entered the monastery to view his body; in the crush, many were able to take home parts of his habit. He was initially buried at Úbeda, but, at the request of the monastery in Segovia, his body was secretly moved there in 1593. The people of Úbeda, however, unhappy at this change, sent a representative to petition the pope to move the body back to its original resting place. Pope Clement VIII, impressed by the petition, issued a Brief on 15 October 1596 ordering the return of the body to Úbeda. Eventually, in a compromise, the superiors of the Discalced Carmelites decided that the monastery at Úbeda would receive one leg and one arm of the corpse from Segovia (the monastery at Úbeda had already kept one leg in 1593, and the other arm had been removed as the corpse passed through Madrid in 1593, to form a relic there). A hand and a leg remain visible in a reliquary at the Oratory of San Juan de la Cruz in Úbeda, a monastery built in 1627 though connected to the original Discalced monastery in the town founded in 1587. The head and torso were retained by the monastery at Segovia. There, they were venerated until 1647, when on orders from Rome designed to prevent the veneration of remains without official approval, the remains were buried in the ground. In the 1930s they were disinterred, and now sit in a side chapel in a marble case above a special altar built in that decade. Proceedings to beatify John began with the gathering of information on his life between 1614 and 1616, although he was only beatified in 1675 by Pope Clement X, and was canonized by Benedict XIII in 1726. When his feast day was added to the General Roman Calendar in 1738, it was assigned to 24 November, since his date of death was impeded by the then-existing octave of the Feast of the Immaculate Conception. This obstacle was removed in 1955 and in 1969 Pope Paul VI moved it to the dies natalis (birthday to heaven) of the saint, 14 December. The Church of England commemorates him as a "Teacher of the Faith" on the same date. In 1926, he was declared a Doctor of the Church by Pope Pius XI after the definitive consultation of Reginald Garrigou-Lagrange O.P., professor of philosophy and theology at the Pontifical University of Saint Thomas Aquinas, Angelicum in Rome. Saint John of the Cross is considered one of the foremost poets in the Spanish language. Although his complete poems add up to fewer than 2500 verses, two of them—the Spiritual Canticle and the Dark Night of the Soul—are widely considered masterpieces of Spanish poetry, both for their formal stylistic point of view and their rich symbolism and imagery. His theological works often consist of commentaries on these poems. All the works were written between 1578 and his death in 1591, meaning there is great consistency in the views presented in them. The Spiritual Canticle is an eclogue in which the bride (representing the soul) searches for the bridegroom (representing Jesus Christ), and is anxious at having lost him; both are filled with joy upon reuniting. It can be seen as a free-form Spanish version of the Song of Songs at a time when translations of the Bible into the vernacular were forbidden. The first 31 stanzas of the poem were composed in 1578 while John was imprisoned in Toledo. It was read after his escape by the nuns at Beas, who made copies of these stanzas. Over the following years, John added some extra stanzas. Today, two versions exist: one with 39 stanzas and one with 40, although with some of the stanzas ordered differently. The first redaction of the commentary on the poem was written in 1584, at the request of Madre Ana de Jesús, when she was prioress of the Discalced Carmelite nuns in Granada. A second redaction, which contains more detail, was written in 1585–6. The Dark Night (from which the spiritual term takes its name) narrates the journey of the soul from its bodily home to union with God. It happens during the night, which represents the hardships and difficulties met in detachment from the world and reaching the light of the union with the Creator. There are several steps in this night, which are related in successive stanzas. The main idea of the poem can be seen as the painful experience that people endure as they seek to grow in spiritual maturity and union with God. The poem of this title was likely written in 1578 or 1579. In 1584-5, John wrote a commentary on the first two stanzas and first line of the third stanza of the poem. The Ascent of Mount Carmel is a more systematic study of the ascetical endeavour of a soul looking for perfect union, God and the mystical events happening along the way. Although it begins as a commentary on the poem The Dark Night, it rapidly drops this format, having commented on the first two stanzas of the poem, and becomes a treatise. It was composed sometime between 1581 and 1585. A four-stanza work, Living Flame of Love, describes a greater intimacy, as the soul responds to God's love. It was written in a first redaction at Granada between 1585-6, apparently in two weeks, and in a mostly identical second redaction at La Peñuela in 1591. These, together with his Dichos de Luz y Amor (or "Sayings of Light and Love") and Saint Teresa's writings, are the most important mystical works in Spanish, and have deeply influenced later spiritual writers all around the world. Among these are T. S. Eliot, Thérèse de Lisieux, Edith Stein (Teresa Benedicta of the Cross) and Thomas Merton. John has also influenced philosophers (Jacques Maritain), theologians (Hans Urs von Balthasar), pacifists (Dorothy Day, Daniel Berrigan and Philip Berrigan) and artists (Salvador Dalí). Pope John Paul II wrote his theological dissertation on the mystical theology of Saint John of the Cross. His writings were first published in 1618 by Diego de Salablanca. The numerical divisions in the work, still used by modern editions of the text, were introduced by Salablanca (they were not in John's original writings) in order to help make the work more manageable for the reader. This edition does not contain the Spiritual Canticle however, and also omits or adapts certain passages, perhaps for fear of falling foul of the Inquisition. The Spiritual Canticle was first included in the 1630 edition, produced by Fray Jeronimo de San José, at Madrid. This edition was largely followed by later editors, although editions in the seventeenth and eighteenth centuries gradually included a few more poems and letters. The first French edition was published in Paris in 1622, and the first Castilian edition in 1627 in Brussels. A critical edition of St John of the Cross's work in English was published by E Allison Peers in 1935. Working out the main influences on John’s thought has been an ongoing debate. John was clearly influenced by the Bible. Scriptural images are common in both his poems and prose—in total, there are 1,583 explicit and 115 implicit quotations from the Bible in his works. The influence of the Song of Songs on the Spiritual Canticle has often been noted, both in terms of the structure of the poem, with its dialogue between two lovers, the account of their difficulties in meeting each other and the "offstage chorus" that comments on this action, and also in terms of the imagery of pomegranates, wine cellar, turtle dove and lilies, for example, which echoes that of the Song of Songs. In addition, John shows at occasional points the influence of the Divine Office. This demonstrates how John, steeped in the language and rituals of the Church, drew at times on the phrases and language here. In order to gain a better understanding of the intellectual influences to which John was exposed in his formative years (and so to isolate what shaped his unusual theology), many scholars have tried to reconstruct John's likely course of studies while he was at Salamanca between 1563 and 1567, living at the Carmelite College of San Andrès and studying at the University of Salamanca. It has been widely acknowledged in the 20th century to be most likely that John would have received teaching both from the College of San Andres and from Salamanca University. If taught at the College of San Andrès, John would have been exposed to the teachings of both Michael of Bologna and John Baconthorpe, with the Spanish Carmelites of the day concentrating more on Baconthorpe's thought. There are, however, no clear signs of the influence of either writer in John's works. Perhaps no more can be said of the influence of Baconthorpe than that, given that he was a "subtle and eclectic scholar who did not hesitate to disagree with Aquinas on many important issues", it might be "that acquaintance with his works may have helped John to avoid any slavish adherence to Thomistic doctrines". In the University itself, there is widely acknowledged to have existed a range of intellectual positions. Academic positions in John's time included Chairs of St. Thomas, Chairs of Scotus and Durandus. Typically, it is assumed that John would have been educated here in the thought of Thomas Aquinas, explaining the influence of Thomas on much of the scholastic framework of his writings. However, the belief that John was taught at both the Carmelite College of San Andrès and at the University of Salamanca has been criticised. He argues, firstly, that it is unclear whether there were in fact lectures in arts and theology at the College of San Andrès before 1571, that a reconstruction of the typical timetable of teaching at the University of Salamanca shows that there would have been little time for extra teaching at the College of the San Andrès, and that what therefore happened at San Andrès (if indeed it happened at all) is therefore likely to have taken the form of rehearsals, preparation of classes, and not in an official form — making the idea that John received systematic exposure to Baconthorpe less likely. More controversially, Bezares calls into question whether John even studied theology at the University of Salamanca. The philosophy courses John probably took in logic, natural and moral philosophy, can be reconstructed, but Bezares argues that John in fact abandoned his studies at Salamanca in 1568 to join Teresa, rather than having graduated, meaning that he did not study theology in Salamanca. Another claim frequently made about John's time in Salamanca, by scholars trying to explain the origins of John's mystical thought, is that it was here he was exposed in detail to mystical thought. In the first biography of John, published in 1628, it is claimed, on the basis of information from John's fellow students, that he in 1567 made a special study of mystical writers, in particular of Pseudo-Dionysius and Saint Gregory the Great. Much weight has been put on this evidence by later writers. However, others have doubted the veracity of this anecdote, even though they do not dispute that John may have studied mystical theology in this period. There is little consensus from John's early years on his potential influences. Although a list of theologians about whom John may have been taught can be drawn up, the evidence is not sufficient to make firm judgements on who may have influenced him. It has rarely been disputed that the overall structure of John’s mystical theology, and his language of the union of the soul with God, is influenced by the pseudo-Dionysian tradition. However, it has not been clear whether John might have had direct access to the writings of Pseudo-Dionysius, or whether this influence may have been mediated through various later authors. The main conduit of Dionysian spirituality into ascetic-mystical literature on contemplative prayer in sixteenth-century prayer (such as that by John of the Cross and Teresa of Ávila appears to have been through the recogido tradition of Francisco de Osuna, Bernardino de Laredo and others. Osuna’s focus on recogimiento (recollecting or gathering of the senses) as a means of prayer, bears similarity to John’s discussion of prayer, and may have been an influence. In terms of Spanish writing, it is notable that although the second half of the sixteenth century produced many great mystics, mysticism was not common in Spain before that. It is widely acknowledged that John may have been influenced by the writings of other medieval mystics, though there is debate about the exact thought which may have influenced him, and about how he might have been exposed to their ideas. The possibility of influence by the so-called "Rhineland mystics" such as Meister Eckhart, Johannes Tauler, Henry Suso and John of Ruysbroeck has also been mooted by many authors. Others have seen Tauler alone as most influential. Alongside the Rhineland mystics, others have argued for the influence of the Victorines and Bonaventure. Most recently, Peter Tyler has argued that John adopts a style of writing, a "performative discourse", which works on both the reader's affect and intellect, in a tradition following a lineage from Pseudo-Dionysius, the Victorines, Jean Gerson and through intermediaries such as Francisco de Osuna. It is unclear, though, how John might have had access to the works of the Rhineland mystics. These works were only translated into Latin in the second half of the sixteenth century. This means that copies would hardly have been easily available for John. In addition, if it is acknowledged that an influence on John was Francisco de Osuna (who clearly cannot have read the Rhineland mystics since they were not known in Spain in the 1520s), then another problem is raised. However, a strong argument can also be made for contemporary Spanish literary influences on John. This case was first made in detail by Dámaso Alonso, who believed that as well as drawing from scripture, John was transforming non-religious, profane themes, derived from popular songs (romanceros) into religious poetry; Alonso argued that John was particularly influenced by the works of the Spanish Renaissance poets Garcilaso de la Vega and Boscán. Certainly, John does appear to have used Garcilaso's verse forms in his own poetry, in particular in the Spiritual Canticle, Dark Night, and Living Flame of Love. Alongside the various biblical images noted above, for example, exist in John's poems many new Renaissance symbols of pastoral love, prominent in the poetry of Garcilaso and Boscán, such as sirens, nightingales, nymphs, doves and shepherds. Moreover, in the Prologue to the Living Flame, John states that "the composition of these lyric lines is like those that in Boscán are given a religious meaning". Kavanaugh (1991) also points out that these lines are in fact not by Boscán, but by Garcilaso, although the confusion was common at the time, as the works of the two poets had been published together. Others, though, have questioned the evidence for precisely how John might have been influenced by Boscán and Garcilaso. Dámaso Alonso argued that John must have read the newly published 1575 edition of the poets in Ávila, shortly before his imprisonment in Toledo, and that this must have been the key influence which rekindled in John memories of his own reading of Garcilaso as a young student of the Jesuits in Medina del Campo. However, Peter Thompson disputes this, arguing it is not definite John would have been familiar with Garcilaso from an early age, and even so the influence has been overemphasised by other commentators. A controversial theory of the origins of John’s mystical imagery is that he was influenced by Islamic sources. This was first proposed in detail by Miguel Asín Palacios and has been most recently put forward by the Puerto Rican scholar Luce López-Baralt. Arguing that John was influenced by Islamic sources on the peninsula, she traces Islamic antecedents of the images of the "dark night", the "solitary bird" of the Spiritual Canticle, wine and mystical intoxication (the Spiritual Canticle), lamps of fire (the Living Flame) and so on. Peter Tyler, though, puts forward a number of coherent objections to this line of enquiry. Firstly, as he points out, these metaphors, while present in certain Islamic sources in other parts of the Muslim world, are not always prominent in the Andalucian and North African Islamic sources. Secondly, in any case, John is using them in different ways from the Islamic sources. Thirdly, and crucially, there seems to have been little cultural interplay between Islamic culture and Christian culture in Spain by the late sixteenth century, with sources existing in different languages, not being translated, and of course all Muslims already having been forced to leave Spain. Rather, Tyler concludes, there "are sufficient Christian medieval antecedents for many of the metaphors John employs to suggest we should look for Christian sources rather than Muslim sources". As José Nieto indicates, in trying to locate a link between Spanish Christian mysticism and Islamic mysticism, it might make more sense to refer to the common Neo-Platonic tradition and mystical experiences of both, rather than seek direct influence. Jean Baruzi argued that the Spanish mystics created their decisive symbols independently of the historical conditions of the time. This theory, however, has not been widely pursued. ^ a b The day is unknown. The parish registers were destroyed by a fire in 1546, and the only serious evidence is an inscription on the font in the church, dated 1689. Midsummer Day is sometimes cited as the date of John's birth, but since this is also the Feast of St John the Baptist, this may simply be conjecture. See E Allison Peers, Spirit of Flame: A Study of St John of the Cross, (London: SCM Press, 1943), p. 11. ^ In 1952, the Spanish National Ministry for Education named him Patron Saint of Spanish poets. The same ministry repeatedly authorized and approved the inclusion of John's writings among the canon of Spanish writers. ^ Rodriguez, Jose Vincente (1991). God Speaks in the Night. The Life, Times, and Teaching of St. John of the Cross'. Washington, DC: ICS Publications. p. 3. ^ a b c d e f g h i j k Kavanaugh, Kieran (1991). "General Introduction: Biographical Sketch". In Kieran Kavanaugh. The Collected Works of St John of the Cross. Washington: ICS Publications. pp. 9–27. ISBN 0-935216-14-6. ^ Matthew, Iain (1995). The Impact of God, Soundings from St John of the Cross. Hodder & Stoughton. p. 3. ISBN 0-340-61257-6. ^ The month generally given is May. E. Allison Peers, Complete Works Vol. I (1943, xxvi), agreeing with P. Silverio, thinks it must have been substantially later than this, though certainly before 27 September. ^ He is possibly the same Pedro Fernández who became the Bishop of Ávila in 1581. It was he who appointed Teresa in 1571 as prioress in Ávila, but who also enjoyed good relations with the Carmelite Prior Provincial of Castile. ^ Kavanaugh (1991) states that this was all the Discalced houses founded in Andalusia. E. Allison Peers, Complete Works, Vol. I, p. xxvii (1943) states that this was all the Discalced monasteries but two. ^ Peter Tyler, St John of the Cross (New York: Continuum, 2000), p. 28. The reference to the El Greco painting is also taken from here. The priory no longer exists, having been destroyed in 1936 — it is now the Toledo Municipal car park. ^ Dark night of the soul. Translation by Mirabai Starr. ISBN 1-57322-974-1 p. 8. ^ Peter Tyler, St John of the Cross (New York: Continuum, 2000), p. 33. The Hospital still exists, and is today a municipal art gallery in Toledo. ^ C. P. Thompson, St. John of the Cross: Songs in the Night, London: SPCK, 2002, p. 122. This would have been largely by foot or by mule, given the strict rules which governed the way in which Discalced friars were permitted to travel. ^ Eric Truman Dicken, The Crucible of Love, (1963), pp. 238–242, points out that this image is neither a true representation of John's thought, nor is it true to the image drawn by John himself of the 'Mount'. This latter image was first published in 1929, and is a 1759 copy from an original (now lost) almost certainly drawn by John himself. It is the 1618 image, though, which was influential on later depictions of the 'Mount', such as in the 1748 Venice edition and 1858 Genoa editions of John's work. ^ Kavanaugh, The Collected Works of St John of the Cross, 34. ^ Kavanaugh, The Collected Works of St John of the Cross, 634. ^ This occurs in the Living Flame at 1.16 and 2.3. See John Sullivan, 'Night and Light: the Poet John of the Cross and the Exultet of the Easter Liturgy', Ephemerides Carmeliticae, 30:1 (1979), pp. 52-68. ^ This is contrary to the seventeenth-century biographies, which do not mention any classes at the College of San Andrès. This thesis was proposed by both Jean Baruzi, Saint Jean de la Croix (1924), and Crisgono de Jesús Sacramentado, San Juan de la Cruz (1929). ^ Luis Girón-Negrón, 'Dionysian thought in sixteenth-century Spanish mystical theology'. Modern Theology, 24(4), (2008), pp. 693–706. ^ However, there is little precise agreement on which particular mystics may have been influential. Jean Orcibal, S Jean de la Croix et les mystiques Rheno-Flamands (Desclee-Brouwer, Presence du Carmel, no. 6); Crisogono (1929), I, 17, believed that John was influenced more by German mysticism, than perhaps by Gregory of Nyssa, Pseudo-Dionysius, Saint Augustine, Saint Bernard, the School of Saint Victor and the Imitation. ^ Liz Carmichael, "Appendix", in Norbert Cummins, Freedom to Rejoice: Understanding St John of the Cross, (1991). Carmichael argues that John's three signs by which the "night of sense" may be recognised are derived from the "Institutions", attributed in John's time to John Tauler, although actually a compendium of excerpts from various German writers of Tauler's time. The Institutions was published in Latin in 1548, and Castilian in 1551. Her hypothesis is that John must have had contact with this work at Salamanca, especially if he did indeed write a short thesis on contemplation while there. ^ A Benedictine of Stanbrook Abbey, Mediaeval Mystical Tradition and John of the Cross (London: Burns & Oates, 1954) argues for the influence of (a) the Victorines (b) Bonaventure (c) the German and Flemish mystics. ^ Peter Tyler, St John of the Cross (New York: Continuum, 2010). ^ Kavanaugh, The Collected Works of St John of the Cross, 640. Wikimedia Commons has media related to Juan de la Cruz.